Ajays (now bankcrupt) NET20DC 2.0 EHCI controller debug device. Serial ports have been the primary means of early debugging of new coreboot ports. New hardware doesn't always have a serial port and another method for early debugging is needed. The EHCI Debug Port is an optional capability of EHCI controllers which can be used for that purpose. All USB2 host controllers are EHCI controllers. The debug port provides a mode of operation that requires neither RAM nor a full USB stack. A handful of registers in the EHCI controller PCI configuration and BAR address space are used for all communication. All three transfer types are supported (OUT/SETUP/IN) but transfers can only be a maximum of 8 bytes and only one specific physical USB port can be used. A Debug Class compliant device is the only supported USB function that can be communicated with. While the Debug Class functional spec describes a device communicating over USB also with the debugging host (aka remote) it would be very possible to make a Debug Class device with a regular serial port on the other end. One thing to watch out for is that such a device might not be able to handle the same throughput as the debug port itself and hence may lose data unless it can do some buffering. AMD SB600 OK Tested by Uwe Hermann. AMD SB700 WIP Probably won't work, a patch is being prepared. AMD A85X (Hudson D4) OKhttps://www.coreboot.org/BeagleBone_Black_-_screwdriver Tested by Tobias Diedrich on ASUS F2A85M-LE. Intel 82801GX (ICH7) OK Tested by Sven Schnelle on Lenovo Thinkpad X60/T60. NVIDIA MCP55 OK Tested by Uwe Hermann. 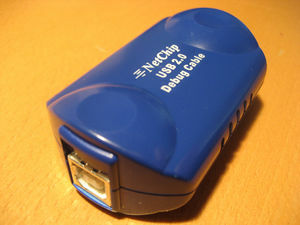 Any physical USB port will work, as the code tries all ports until the one with the attached USB Debug device is found. SiS SiS966 Untested Note: It's unclear if the chipset actually has EHCI Debug Port functionality, and (if yes), whether the current coreboot code supports it properly (or whether it's just copy-pasted code from another chipset). Generally, each EHCI controller can offer at most one debug port. That port corresponds to a fixed physical USB port. Locating that physical port without software is rather difficult because you need to look at lots of information. Carl-Daniel Hailfinger has written a script which can help finding that port. An updated script was posted here on May 30 2014. To get a USB debug console, enable both CONFIG_USBDEBUG and CONFIG_CONSOLE_USB (menu option USB 2.0 EHCI debug dongle support) in coreboot's kconfig. In case your system has more than one debug-capable EHCI, you can select the index as CONFIG_USBDEBUG_HCD_INDEX, with a southbridge-specific value (on AMD Hudson, 0 and 1 both indicate the first port, 2 is the second port). On your "host PC" you need a Linux system which is recent enough to provide the usb_debug kernel module. When you attach the Ajays Net20DC device to your host PC, it will create a /dev/ttyUSB0 device to which you can connect as usual using any serial terminal program, e.g. minicom (115200, 8n1). TODO: Is the Baud rate actually configurable somewhere? You must connect the NET20DC to a special USB port on your coreboot target board (not all of the USB ports will work! ), often this is USB port 1. If in doubt, try all available ports to check which one works on your board. Then you can power up your coreboot target board and you should see the usual coreboot bootlog in minicom on your host PC. As an alternative, you can also use this small libusb-based user-space program on the host PC to retrieve the coreboot logs. The Debug Port is optional, please check if EHCI controllers near you support it: lspci -v | grep ehci. If you get any result try lspci -v and locate the entry. If your controller isn't already listed below then please add it or send an email to the mailing list if you don't have a wiki account yet and want one, or want us to add your controller to the page. A prebuilt Linux distribution called 'screwdriver' exists: "A tool for coreboot/libreboot/flashrom developers and users. The firmware itself is based on vanilla OpenWrt Chaos Calmer(15.04) with some modifications. This firmware is mainly intended for BeagleBone Black (BBB)." See BeagleBone_Black_-_screwdriver. If you have a device running GNU/Linux that has an usb device port, you could then try to use the EHCI Gadget Debug. Note that it's not guaranteed to work on old kernels, and may be dependant on the usb device/otg controller driver. You can make your own usb debug dongle, see DIY EHCI debug dongle. To be able to use the debug port it needs to be connected to a compatible device. There are two commercial devices available which can use the EHCI Debug Port, the AMIDebug Rx and Ajays NET20DC. 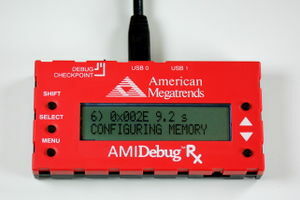 AMI Debug Rx USB 2.0 EHCI controller device. This device is expensive compared to the other devices on this page. The main advantage of this product is that it comes with LCD. "Interested parties may contact AMI for pricing and purchasing information" - AMI. point of contact: www.ami.com, phone number 1-800-828-9264. Disclaimer:Ajays is bankcrupt so their product line is end of life (EOL). Symmetry Electronics and other companies have disengaged as a supplier of the Ajays Technology product line. This limits the number of available units on the market. The device can be used in both directions, but only one side provides power for the circuit. Make sure to connect the front port (see picture at the top) to your host device and the rear port to the DUT. On the host side it doesn't matter which USB port to use, on the DUT side use the DEBUG port. Under GNU/Linux the device shows up as a regular serial USB device (ttyUSBx). EHCI 1.0 spec (PDF) — The Debug Port is described in Appendix C.
Debug Class functional spec (PDF) — This is what has to be connected to the EHCI controller. This page was last modified on 20 August 2017, at 20:18.